A pro-Obama “grassroots” organization sent out a mass e-mail from [email protected] today, which practically accuses anyone who supports a ban on late-term abortions as being sexist. 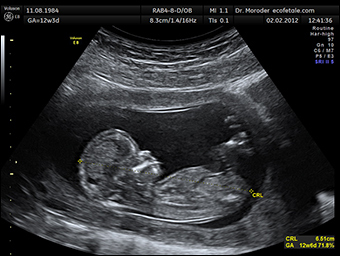 An ultrasound of a baby at 12 weeks and six days. Credit: Wolfgang Moroder via Wikipedia. Organizing For Action, a non-profit created out of Obama’s 2012 campaign operation and described as “grassroots” even though it is based in Washington, D.C., wrote the e-mail in response to a citizen-initiated ordinance in Albuquerque, N.M. to ban abortions after 20 weeks of pregnancy. The e-mail directs readers to barackobama.com, which the group maintains. The organization is essentially labeling anyone who is against abortions after the 20th week of pregnancy, in which the baby begins to grow hair and can even react to loud sounds, as being sexist. Back in September, Hollywood actor Ed Asner said that many celebrities were afraid of being called “racist” if they stood up against Obama’s demand for war in Syria. “A lot of people don’t want to feel anti-black by being opposed to Obama,” he told the Hollywood Reporter. One celebrity, James Woods, did openly criticize Obama on a variety of issues but also admitted that he was likely sacrificing his acting career in order to do so. @mm77atl I don’t expect to work again. I l think Barack Obama is a threat to the integrity and future of the Republic. My country first. The establishment and its supporters are falsely labeling anyone opposed to their policies as “sexist” and “racist” in an effort to suppress resistance to their agenda. This tactic is designed to make Americans too afraid to stand up for what they believe in.